Who spoke the first word of human language? When was that first word uttered? What did that speaker say and why? Linguists outlawed these questions in 1866 when the Société de Linguistique of Paris declared a moratorium on the topic of how and when language first arose. Scholars who explored these questions were roundly accused of being disreputable, of being engaged in a fruitless search that could only lead to purely speculative answers. These scholars were shunned by the international linguistics community, their papers seldom seeing the light of publication. It was only in 1990, with the publication of Steven Pinker and Paul Bloom’s “Natural Language and Natural Selection,” that the moratorium really lifted. To be sure there had been scholars publishing on the topic before, but the debate that Pinker and Bloom’s paper occasioned opened the floodgates for studies on the origins of language. The late twentieth century was the moment when anthropology, linguistics, primatology, physiology, computer modelling, neurobiology, and genetics had together reached a critical mass of knowledge that would allow us to begin tracing our way back to the origins of language. Christine Kenneally tracks the rise of these studies and the tantalizing clues they’ve given up about the origins of language. She walks us through an intellectual history that begins with Noam Chomsky, who popularized the view that language syntax was innate in humans, but not a product of natural selection. He focused on how this innate language faculty was expressed in human languages but not on where that faculty might have come from. Yet, despite Chomsky’s massive influence in the linguistic community, scholars like Sue Savage-Rumbaugh—whose work with bonobos showed that they can, up to a point, acquire and use human language—began to argue that language is not particular to the human species. Well before the moratorium was lifted Savage-Rumbaugh and others argued that we can see evidence of basic language faculties in other animals like Washoe the chimp, Alex the grey parrot, and Kanzi the bonobo. These results suggested that language had indeed been evolving before the first homo sapiens drew breath. In their 1990 paper Pinker and Bloom argued that language is adaptive in the same way that stereoscopic vision and echolocation are adaptive. And though language requires an astonishing number of precise adaptations, they pointed out that the same is true of stereoscopic vision—which requires correctly placed eyes containing lenses, cornea, irises, and a dizzying number of muscles, rods, cones, and neurons—and that the scientific community had long agreed that our vision is the product of adaptive evolution. Language, Pinker and Bloom asserted, because of its adaptive qualities, must be the product of natural selection, too. Kenneally wraps up her tour of this scholarly terrain with Philip Lieberman. He answered the question often asked of researchers like Savage-Rumbaugh—If apes can understand speech and use sign language, why don’t they talk? His long-term studies of the biophysics of speech show that, because of the physiology of their tongues, apes cannot make the full range of human speech sounds. Lieberman also demonstrated that there is a direct connection between the basal ganglia (the motor-control centre of the brain) and our ability to order our thoughts, to use syntax. What’s more, he showed that humans aren’t the only ones whose basal ganglia are working double duty—rats, birds and many, many other animals have basal ganglia, too, and evidence shows that at least some of them are using them to order social sequences of behaviour. The innate language syntax that Chomsky attributed to humans looks like it’s much more universal than he realized back then. The intellectual history outlined above is the entry point to Kenneally’s book. Having established the arguments, and infighting, in the linguistic community, she begins to look at the many fascinating discoveries that have been made since the origin of language once again became a respectable study. She points out that human language requires that we have something to say, words to say it with, gestures and speech, and the ability to organize thoughts. She also reminds us that everyone who has ever used human speech also has genes that mutate, and presents us with compelling reasons to believe that humans, cultures and languages themselves mutate under the forces of natural selection. 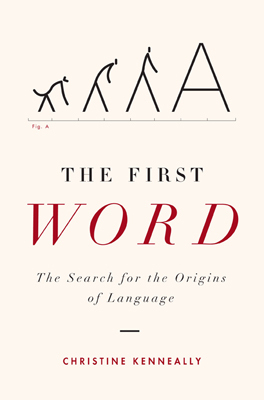 Kenneally’s book is a highly readable, fascinating survey of the burgeoning field of language evolution. If you’ve ever wondered where all these words of ours came from, you’ll want to check out this book. What strikes me as particularly intriguing is the universality of languages—English and Korean, for example, are vastly different, but they share common features. I wonder if such distant relationships are the product of language diaspora or whether all languages are shaped in similar ways because of neurological structures. Nice blog—I’ll be coming back.